One of the key messages is that when 19th Century industrialists were offered utility power from a central provider for the first time, all they could think of was that their lathes would keep turning – they didn’t see electricity as a solution to all sorts of unimagined potentialities (such as lighting). The parallel is to ask the question, what are we missing out on today, what hidden potentialities exist in Cloud that we haven’t yet figured out? Often people think about how they are going to put their data into the Cloud – if they are using Software as a Service, like Salesforce or Netsuite or Intacct or Clarizen, or Google Apps for that matter, they will be thinking about how to get their data into a shape that can go into the system. The documentation for these systems make clear reference to how to prepare and then import the customer’s data, and there are usually consultants who can assist with this process. Typically this process is well planned, but often little thought is given to how exactly you go about extracting the data out again in a way that is of value to you going forward. Often, lip service is paid to the issue by asking questions like “can I get a back up of my data?”, and a reassuring yes is provided to the now comforted prospective customer. It is one thing to be told it can be done, but you need to check that the data is actually in a format that is useful to you. And if the system is mission critical, it needs to not just be useful, it needs to be readily convertible for immediate use. Some of the things I have done to ensure that my data is safe include writing programs that automatically read the data for updates every fifteen minutes and write them into a Relational Database hosted separately, and even replicated both in house and in the Cloud. All customisations are programmatically managed so that the relational database copy always reflects the structure in the live system. For example, I did this from Salesforce, where there were more than 300 custom objects created. Another example is to write a program that knows how to extract all the data from a system, such as an accounting system, using the API provided. Not until you have actually proven tangibly that you can get your data into a format you can actually use, it is meaningless to have access to a copy of it. Even without programming, many systems provide some access to your data in a way you can extract it. For example Salesforce provide a once-per-week csv file you can download. If you don’t have an alternative means it is worth setting up a routine with someone responsible to take this data and copy it. On line databases such as Amazon RDS or Simple DB can be accesed easily enough through OLEDB connections or similar, or copies of the backups can be stored locally in a format that can be opened by alternative data stores. No matter how you do it, the principle is important here: you should have a fully tested means of accessing your data off line. The more mission critical the data, the more real-time the recoverability needs to be. Steve Jobs’ passing reminded everyone of the Apple Think Different campaign, but seriously, you need to think Differently when it comes to the Cloud in order to leverage it successfully. It truly is different to anything we have seen, and if you are only seeing it as a cost mitigator or a means of outsourcing infrastructure, you are missing a lot of (pardon the pun) blue sky behind the Cloud. Social networking, crowdsourcing, ubiquity of device and location, Metcalfe’s law in general, scalability, the ability to fail fast and loosely coupled web services are all factors of the Cloud that lend itself to being different. One example is the way that Salesforce enables you to leverage the power of Twitter and Facebook by recording people’s Twitter and Facebook details against their record and if they tweet or post something with a given hashtag, the system is watching and can automatically create a case for them, assign it to a support officer who can find a solution, link the solution and automatically have the system tweet them with a response and a link. Another example is the way captchas are being used to get the masses to perform optical character recognition on historical documents that are too poor for a machine to read. The system uses a known control word to determine whether you are human or not and poses a second one that is not known. 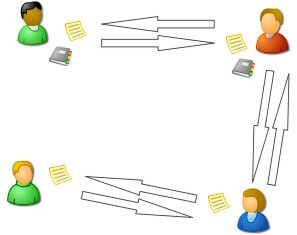 The results are compared against the results entered by others who have received the same word – a high correlation between results from different users indicates what the text is likely to be. A third example comes from my own testing of the Amazon EC2 platform to test some ideas concerning a new database design that enabled end users to change the structure of the database without programming, kind of like the way Salesforce allows end users to do custom objects. The test was in two parts – the first, which was easy to test, was could it handle more than a billion records. The second, a little more difficult, was, can it handle one thousand simultaneous users on cheap virtual hardware. For this test I needed a simulation that ran across eleven machines. Traditionally I would need to acquire these eleven machines and set them up – an expensive and time consuming exercise. Using Amazon EC2, I was able to set up the machines from scratch in thirty minutes, run my tests in three hours, and then analyse the results. Total cost? Less than five dollars. There are plenty of ways the Cloud can transform how you do business if you allow it. Get your sales team to focus on harder sells while the Cloud is engineered around a Marketing Automation experience that drives their behaviour for all the low hanging fruit. The Cloud itself, if you configure it correctly, will tell you where the low hanging fruit are. One of the issues with having Cloud-based systems is that you can build compelling processes out of tools from a number of vendors’ systems working together. Linking your CRM to your financials, or your website to marketing automation and analytics for example. While these may seem obvious examples, the point being made here is that we need to ensure when multiple systems are involved that we are thinking about how to prevent a situation where only part of a system succeeds. This is a much more common problem when different types of systems are talking together. So make sure you are not telling the customer that his request for information has been placed in a queue unless you know for sure that the request has been placed in a queue. When I first started looking at Cloud concepts about six years ago I was looking with the eyes of a sceptic and I was asking the question “What can’t I do if I adopt this approach?” By taking this kind of view I found there were plenty of things I didn’t think I could do, and this thinking led me to see restrictions and obstacles. Once I started to ask myself rather contrary question “What can I do if I adopt this approach?”, I started to see all sorts of opportunities emerge. I understand from Salesforce I was possibly the first person in the world to see their CRM product as a business platform rather than a CRM product. This led to building all sorts of systems within Salesforce including purchase requisitioning, customer software licensing, electronic production management systems with automated QA built in and tested on the finished manufactured products (with the results of the tests stored against each product and displayed to the end user when he or she finally purchased the product and plugged it into a computer). Other systems included Human Resources systems with annual leave management systems, individual development plans and hierarchical cost management for each line manager, who could also see things like who had the most leave accrued in the team. Thinking of what is possible also leads to being able to try things experimentally with a “fail-fast” attitude. The example provided above about the eleven computers is an example of this. But being able to put ideas into practice quickly makes all sorts of innovative approaches viable that may be otherwise ignored or side stepped as pipe dreams. In traditional approaches, a startup may need to think of architecting a business for the first generation of clients. As the numbers grow, a different architecture may be required, or investment may be required in infrastructure just in case growth may occur. One of the risks of any business that grows too quickly is one of running out of liquid cash. All this can be very limiting in an entrepreneurs thinking, with a real chance that the fear of succeeding too quickly may cause them to underperform. Often the Cloud allows an architecture to scale far further than using traditional approaches, with the ability to consume infrastructure and related services as required, scaling rapidly up, and then if necessary, scaling rapidly back down again. Traditional models require risky investments, Cloud models are far more flexible. And this allows for more optimistic thinking. Most mainstream cloud vendors, whether they be offering Software as a Service, Infrastructure as a Service or a Platform as a Service, will have some sort of API that enables you to read and write data, change metadata, set permissions etc. This is important if you want to truly leverage the power that is available to you. For example, you can use Amazon’s Simple Notification Service and Simple Queueing Service to provide asynchronous connections between systems and plan to notify managers when a VIP customer representative has mentioned your company in a tweet. Having a rich API in your bag of tricks enables you to innovate with freedom, seeing the Cloud as one Cloud rather than a disparate products offered by a host of different people. This is something I was guilty of in the early days. I used to say “these guys know better so you can trust them to make sure your data is safe”. Recent events have made me a little more open eyed about the inner workings. If you are not sure how your data is being backed up, ask. Imagine you are having to satisfy your auditor about the safety of your data. Imagine you are having to satisfy your customer that their data is safe, secure and reliably stored. If you don’t know yourself what steps are being taken to guarantee the preservation of the data, you won’t be able to tell them, and you will come across poorly. I have written an earlier post about an Australian ISP that collapsed after an attack that took out the server with all of their clients’ websites. They had no offsite backup. Recently, Salesforce, one of the most respected companies had two outages on Sandboxes that caused the loss of the customer data on those sandboxes and the data was down for several days. Amazon had a well publicised outage earlier in the year that brought into question the way their system handled mass failure. Separate zones, designed to remain up when others failed, went down simply due to the overload caused by the failure of one. These failures, or at least the Salesforce and Amazon ones cited, have resulted in those companies making some changes, but an astute customer robustly challenging the methods may well have picked them up before a major problem occurred. I wrote a post at the time of the major Amazon outage that was picked up by the CIO Magazine. Several companies hosting their data on Amazon Web Services were posting during the outage as if they were innocent bystanders observing the fallout. The reality is that if your services are down it is your responsibility no matter how you host them. Imagine an airline losing an aircraft saying “oops, luckily we outsourced the maintenance on that plane or else it would have looked really bad for us LOL!”. I don’t think so. Remember, it is your data and you are entitled to it, and your are responsible for its availability and its security. This article is the first in a series of articles looking at changes/improvements I would like to see happen. You will find them categorised under the category “Things I Want to See”, and also filed under specific vendors where appropriate. 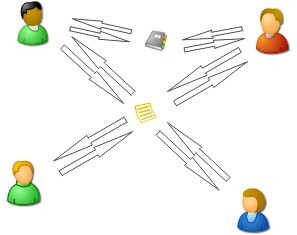 An increasing number of people are coming to understand intuitively the difference between traditional peer-to-peer document sharing modes where multiple instances of documents exist, at least once on each client machine. You know the drill, you attach a document to an email, the recipient opens the attachment, edits it, saves it and then attaches the saved new version to a new email and sends it back. Before long, there are multiple copies of the document and it can be difficult to know how the document evolved. In the case of several people, it can even be difficult to know which version of the document is the current one. There may not even be one single latest version, as two people may edit two different earlier versions at once. Stitching these all back into a master document is not easy.